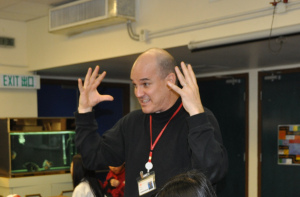 I have been teaching for 23 years in Maryland, Singapore and Japan and now teach 4th grade students in Hong Kong. It has been a wonderful ride. In 1985, I enrolled as an elementary education major at Bridgewater State College in Bridgewater, Massachusetts. Initially I merely wanted to help struggling kids find success in the classroom. As a high school senior, I was an intern in a classroom of learning-disabled elementary-aged children. Within the first week of my internship, I knew I had found my calling, and I have lived a life of learning and teaching ever since. Many inspired educators inside and outside the classroom have affected the way I practice my craft. As a public school student, I was taught to value all teachers, regardless of their capability. As a teacher, I teach my students to value themselves and acquire the habits of lifelong learners. Effective teachers must model kindness, compassion, organization, intelligence, flexibility, and collaboration. They need some understanding of educational technology, a belief in their own ability, trust in their teammates, and perseverance. I am happy if school leaders provide a brain-researched, structured, and engaging differentiated curriculum. My first day as a teacher was nothing short of a disaster; my Mid-Atlantic based students had little idea what their New England teacher, with his thick Boston accent, was saying, I talked way too much, and my students giggled nervously when I tried to communicate.. Although my lesson plans were highly organized, I was painfully unsuccessful as a manager of time. I had no clue just how mentally exhausting the job would be. Today, I am much more relaxed and confident. I investigate neurology–specifically how the human brain actually acquires knowledge–instead of accepting what administrators might tell me. For professional development, I greatly rely on Twitter and my professional learning network. I make the time to read professional trade books more than ever. My advice for new teachers is to live conservatively so that you can be liberal in your craft. Demand more from yourself than any evaluator could ever demand. Work hard. Inspire others to believe in themselves through learning. Teachers, all over the world, why do you STILL teach? How has your teaching practice evolved? What factors stand in the way of your being able to do your best work? This entry was posted in Barry Mernin and tagged international school jobs, international teaching, teaching abroad, teaching overseas. Bookmark the permalink.